You are here: Virgin Islands News Online » News » Car bursts into flames on Windy Hill! Car bursts into flames on Windy Hill! 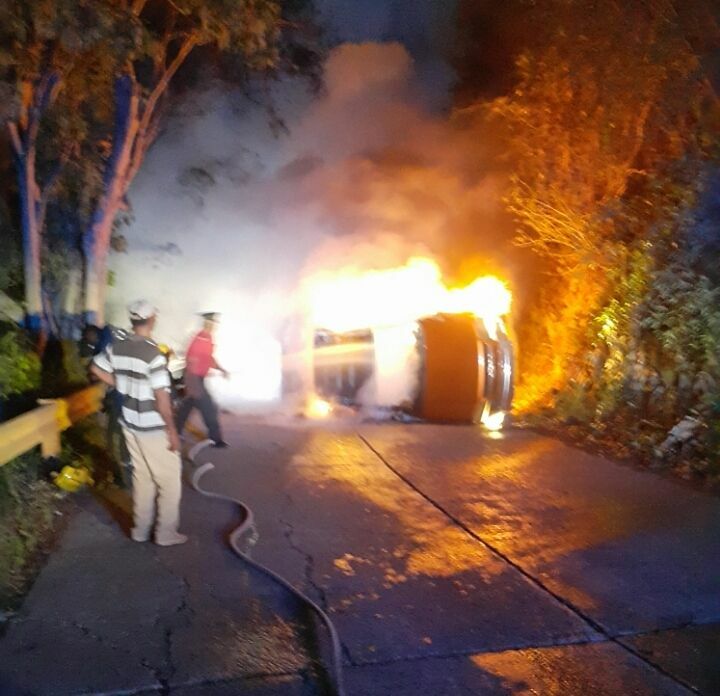 WINDY HILL, Tortola, VI - Sometime this evening, May 28, 2017, a vehicle with only a male driver burst into flames on the Windy Hill area of Tortola. Police, Ambulance and Fire and Recuse were all on the scene, as well as, onlookers after the driver is reported to have lost control after the horn was stuck and toppled along the Windy Hill Road. Fire officers were able to extinguish the flames, however, there is no information up to press time with regards to any injuries sustained by the driver or the type of vehicle. Information reaching this news site is that the vehicle has not been completely destroyed and investigations are underway into the incident. Shoulda bought a locally made car. Not an import. Good old Yank technology there. Metaphor for the future. I guess the BVI manufactures cars so we shouldn't import any. Identify yourself and label your car "Made in The BVI"
LOLOL @ Looks like a chevvy. Sometiems ignorance needs no response. Praying the gentleman, the First Responders attending to the accident, and the onlookers are all doing well and none were seriously hurt. Be safe everyone. I'm convinced that place is cursed. It happened right before the purple cat. All you forget up Windy Hill the white priest used to leave the church singing "hold the fort for I am coming," and go down the Bay to rob ships? What you expect, since you believe in deadly 'art cats', the spirit of that priest pirate may still be running wild at nights on Windy Hill.